Abstract: Echocardiography plays a central role in the characterization of the mitral valve (MV) morphology and functi-on. In the past decade, the development of three-dimensional echocardiography (3DE) has revolutionized valvular imaging, becoming the technique of choice for an accurate evaluation of the MV anatomy and pathophysiology. Transthoracic and transoesophageal 3DE represent complementary imaging techniques to assess the complex MV apparatus in the beating heart, to plan interventions, to monitor transcatheter procedures (e.g. MitraClip, mitral valve balloon valvuloplasty, and paravalvular leak closure) and to assess the results of surgical repair. The aim of this article is to review the contribution of 3DE in evaluating the anatomy and function of the MV apparatus in a variety of MV diseases, highlighting the current clinical applications of this essential echocardiography technique. Rezumat: Ecocardiografia a ocupat dintotdeauna un rol central în caracterizarea morfologiei şi funcţiei valvei mitrale (VM). În ultimul deceniu, dezvoltarea ecocardiografiei tridimensionale (3D) a revoluţionat imagistica valvulară, devenind modalitatea preferată pentru evaluarea cu acurateţe a anatomiei VM, indiferent de patologia evaluată. Ecocardiografi a tran-storacică şi transesofagiană 3D reprezintă instrumente imagistice complementare utile pentru evaluarea funcţiei complexe a aparatului valvular mitral, precum şi în planificarea managementului terapeutic. Acest articol îşi propune să prezinte rolul adiţional al ecocardiografiei 3D pentru evaluarea diverselor patologii ale VM, subliniind aplicaţiile clinice actuale şi avantajele acesteia în raport cu ecocardiografia convenţională. Cuvinte cheie: valvă mitrală, ecografie tridimensională, morfologie, regurgitare mitrală, stenoză mitrală. The echocardiographic assessment of the mitral valve (MV) provides valuable insights into the aetiology and severity of the MV disease, which makes it essential to plan interventions, to guide and monitor transca-theter procedures, and to assess the results of surgi-cal repair1. However, the MV is a complex three-di-mensional structure that requires multiple views and complex mental reconstruction processes to fi gure out its anatomy using conventional two-dimensional echocardiography (2DE). Conversely, by using three-dimensional echocardiography (3DE), we can assess the non-planar mitral annulus (MA) and mitral leafl ets, the complex subvalvular apparatus and their anatomi-cal relationships with the surrounding structures, by virtually “dissecting” the beating heart using different cut planes1. Although cardiac magnetic resonance (CMR) has a higher spatial resolution than echocardiography, with the important advantage of non-invasiveness, its cli-nical use is limited due to increased acquisition time, costs, limited availability and lack of portability at the bedside or in the catheterization and operative roo-ms2. Multi-detector computed tomography, though used for MA anatomical assessment and spatial relati-onship to plan transcatheter interventions, has major limitations related to the inferior temporal resoluti-on, radiation exposure, use of iodinated contrast, the impossibility of real-time imaging, flow assessment or regurgitation severity grading3. Accordingly, 3DE has emerged as the reference standard technique to assess MV morphology and function into clinical practice. This review will address the applications of 3DE, providing an update on its current role for the diagno-sis and clinical management of patients with various MV pathologies. The normal function of the MV requires the structural integrity of all the components of MV apparatus, whi-ch includes: leaflets, MA, chordae tendineae, papillary muscles (PMs), left ventricle (LV) and left atrium (LA), as well as their coordinated functional relationships during the cardiac cycle4. A previous study show-ed that 3DE gives additional information to 2DE MV morphological assessment in 36% of patients5. Normal MV leaflets are thin and highly mobile struc-tures, only partially visualized using tomographic tech-niques. 2DE allows the visualization of the MV leaflets only from the ventricular perspective. Conversely, 3DE allows the visualization of the whole anterior and posterior leaflets of the MV in the same cut plane, whi-ch can be rotated to display the MV either from the ventricular or the atrial (also called surgical) perspec-tive (Figure 1). As a consequence, the echocardiogra-pher does not need to imagine the actual anatomy of the MV from a limited number of tomographic views, but he/she is able to see an anatomically sound image of the MV in the beating heart. All derived views make it possible to obtain a detailed anatomical description of the MV (i.e. presence of calcifications, clefts, prolap-ses, attached masses, etc. )6, and allow an easier pre-, intra- and post-procedural assessment compared with conventional 2DE imaging. Moreover, the „surgical view” of the MV by 3DE facilitates the communication between imaging expert, interventionalist and surge-on. Finally, real-time 3DE gives the unique advantage of a detailed functional assessment of the MV, which is essential to guide valvular interventional procedures. Using dedicated software, the 3D geometry of mitral leafl ets and MA can be easily reconstructed and quan-tified (Figure 2)7. Figure 1. Transthoracic three-dimensional echocardiography assessment of mitral valve anatomy.The mitral valve can be seen from either the atrial (surgi-cal view, panel A) or the ventricular perspective (panel B). The volume rendering display technique allows anatomically sound images and complete visualisa-tion of the leaflets and surrounding structures. Figure 2. 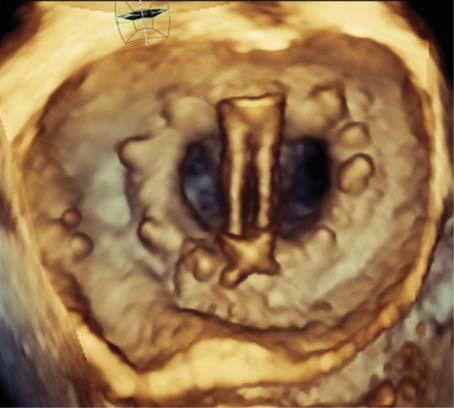 Transesophageal three-dimensional surface rendering display of the mitral valve. This display modality is obtained by semiautomated mapping of the leafl et surface and annulus contour in order to provide a quantitative analysis of the mitral valve annulus and leafl ets using dedicated software packages. The subvalvular apparatus, which includes the PMs and their chordae tendineae, is best appreciated using mul-tiple longitudinal cut planes, allowing an optimal view of the PMs origin and of the chordal insertions on both PMs and MV leaflets. Chordal thickening, elongation or rupture are easily visualized using 3DE volume rendering display1. The MA is a pliable, non-planar, saddle-shaped struc-ture that interconnects the MV leafl ets with the LA and LV walls. The anterior part of MA is the most ele-vated point of the saddle, while the posterior part in-cludes the lowest points of the saddle (near the medial and lateral commissures) and the posterior “horn”8. When viewed in cross-section, MA is D-shaped, with the straight border adjacent to the aortic valve9. The MA is also a highly dynamic structure, during the car-diac cycle: its area reaches a nadir in early systole, conversely its tenting height reaches its maximum at mitral valve closure10,11. Conventional 2DE diameters (i.e. anteroposterior and inter-commissural) are not suitable to provide reliable information about the complex 3D shape and function of the MA. Using commercially available dedicated software packages applied to 3DE data sets, a comprehensive assessment of the MA geometry and function is possible at the bedside for clinical purposes12,13 . These measurements have important implications in selecting the optimal strategy for patients requiring MV surgical or interven-tional treatment. Complementary to conventional 2DE and Doppler pa-rameters, the use of 3D colour flow Doppler imaging may improve the quantification of MV regurgitation and help to guide transcatheter procedures by precisely identifying the origin of abnormal intracardiac flows14-16. 3DE quantification has allowed to increase the dia-gnostic accuracy and reproducibility of the MR seve-rity by integrating new parameters in its systematic approach. Planimetry of the vena contracta area and measurement of 3D effective regurgitant orifice area allow the evaluation of the functional and anatomical regurgitant orifice area, respectively (Figure 7)17-19. Both parameters are devoid of any geometrical as sumption about the shape of the orifice and have been particularly useful in patients with eccentric regurgi-tant jets. Effective regurgitant orifice area and regurgi-tant volumes obtained from 3DE proximal isovelocity area were also reported to signifi cantly increase the accuracy of MR severity quantification, but the method is available on a single echocardiography system20-22. Recently, updated American Society of Echocardiogra-phy guidelines on valvular regurgitations recommend the routine use of 3DE imaging for a comprehensive assessment of MR23. 3DE proved to be more accurate than conventional 2DE to assess the LV and LA geometry and functi-on24-27. In patients undergoing MV surgery, 3DE end-systolic LV volume was an independent predictor of postoperative LV dysfunction28. 3DE end-systolic LV volume provided additive prognostic value on top of M-mode end-systolic diameter and 2DE LV end-systo-lic volume. Finally, 3DE LA minimal volume is emerging as a predictor of adverse outcome in asymptoma-tic patients with severe organic MR29. Management of mitral stenosis (MS) patients relies on an accurate measurement of the mitral orifice area and a comprehensive assessment of MV complex ana-tomy (extent of leaflet thickening, commissural fusi-on, calcification, degenerative changes of subvalvular apparatus, etc.). Doppler-based methods for MV area assessment are heavily influenced by flow dependen-ce, cardiac rhythm and rate, associated regurgitation, as well as the angle of insonation4. Planimetric MV area by 2DE frequently overestimates the actual residual orifice area, since there is no landmark to confirm that the parasternal short-axis 2DE view of the MV is obtained exactly at the level of the smallest MV area and oriented perpendicular to the MV opening axis30. 3DE has overcome these limitations by allowing to position the crop plane at the tips of the stenotic MV leaflets and its orientation to obtain an anatomically correct cross-section of the stenotic MV orifice (Figu-re 3)31. MV area planimetry by 3DE showed a strong correlation with the invasive area measurement (using Gorlin formula)32 and represents the current gold-standard method for assessing MS severity by echo-cardiography6,32. Echocardiographic assessment of the MV is also essential to guide the type of intervention (percutaneous versus surgical) through validated risk scores33,34. Percutaneous mitral balloon valvuloplasty is the method of choice for patients with favourable MV anatomy or when open-heart surgery is contrain-dicated, with 3DE having a crucial role in guiding the procedure — device selection, balloon positioning, and inflation — and assessment of procedural success — MV area quantification by planimetry, extent of commissural opening, leafl et mobility, residual MR — (Figure 4)35. Additionally, 3DE TEE procedure guiding has the advantage of reduced exposure to radiation (particularly important in young patients or pregnant women with rheumatic MV disease)36. Figure 3. Transthoracic three-dimensional quantitation of rheumatic mitral stenosis severity. The cut plane of the three-dimensional dataset (green dotted line) is perpendicular to the opening direction of the mitral valve orifice, at the tip of mitral leaflets level, allowing an accurate planimetry of the smallest residual opening orifice. Figure 4. Mitral valve stenosis before and during balloon valvuloplasty. Transesophageal three-dimensional volume rendering visualization of the rheumatic mitral stenosis. The visualisation of the valve from the ventricular perspective (Panel A) allows to appreciate the leaflet morphology, the extent of fusion commissures and the area of the residual opening orifice. The same ventricular perspective can be used during the percutaneous mitral balloon valvuloplasty to monitor the procedure (Panel B). The accurate description of the MV anatomy is critical before any treatment decision (surgical versus inter-ventional, and repair versus replacement surgery) in patients with organic MR. Soon after the description of MV prolapse (MVP) by conventional echocardiogra-phy, degenerative MV disease prevalence was highly overestimated mostly due to the saddle-shape geo-metry of the MA and the false appearance of leafl ets billowing using M-mode and 2DE37,38. By demonstra-ting the complex shape of the MA, 3DE has led to the reconsideration of the MVP definition as the leaflet displacement above the higher points of the MA39. 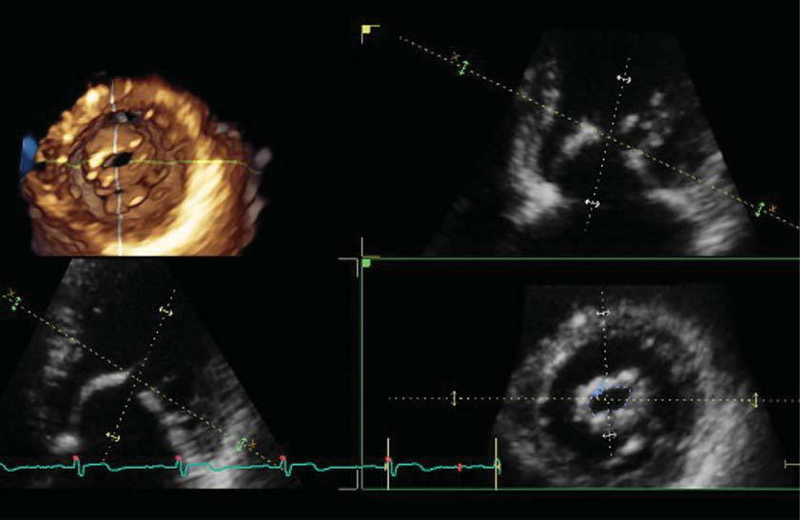 Using the en face view of the MV from the atrial per-spective, the echocardiographer can easily evaluate both MV leaflets and identify precisely the prolapsing scallops bulging into the LA. 3DE is particularly useful in cases of complex MVP, such as commissural lesions or multi-scallop prolapses (Figure 5)40. More than 10 years ago, the accuracy of 3D TTE and TEE in diagno-sing MVP was described to be 95% and 97%, respectively41, but with the latest development of the 3DE technology, nowadays it might be even higher. 3DE has been proved to be useful in both surgical plan-ning and predicting MV repair outcome42,43. Systematic quantification of leafl ets length, total surface area, and billowing volume is necessary to identify patients at risk for systolic anterior motion after MV repair44. Figure 5. 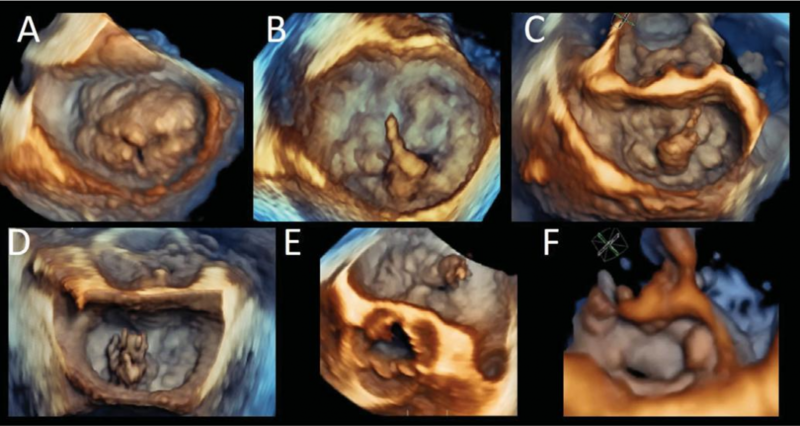 Three-dimensional volume rendering from the left atrial perspective (surgical view) of different forms of organic mitral valve disease. Barlow disease with associated posterior mitral leafl et cleft (Panel A); Barlow disease with P2 flail and chordal rupture (Panels B and C); papillary muscle rupture, bulging into the left atrium during systole, in a patient with fibroelastic deficiency (Panels D and E); medial commissural prolapse (Panel F). Functional mitral regurgitation (FMR) is defined as mitral regurgitation in the presence of a structurally nor-mal MV, developing as the consequence of regional/ global LV dysfunction or LA dilatation, as in patients with chronic atrial fibrillation. Disregarding the aetiology, complex modifi cations occur at the level of the MA: dilatation, flattening and reduced dynamics12,13,45. In patients with LV enlargement, apical tethering of MV leaflets secondary to PM displacement and reduced trans-mitral pressure seems to be the main mecha-nism of FMR. The extent of MV distortion can be carefully assessed using 3DE by quantifying the geometry and function of the MA, the leafl et areas and tethering angles, tenting volume and maximal tethering area, as well as direct visualization of the MV subvalvular appa-ratus anatomy (Figure 6). Although 2DE has a good sensitivity in diagnosing MV vegetations due to its high temporal and spatial reso-lution, the limited number of views is often insufficient to understand the complexity of the lesion (size, origin, the involvement of other structures etc.) and their functional impact. 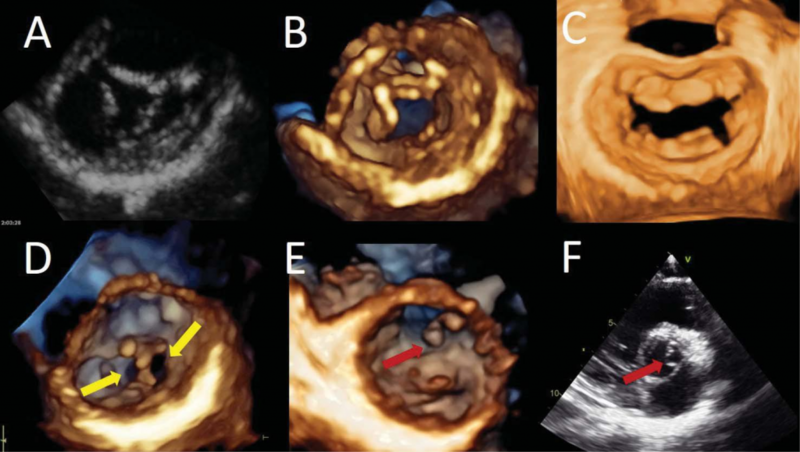 3D TEE is the preferred technique in patients with clinical suspicion of MV endocarditis to exclude or confirm the diagnosis and to identify complications (Figure 8). Figure 6. Functional mitral regurgitation. Three-dimensional reconstruction of the mitral annulus tenting area, volume, anterior and posterior mitral leaflets angles (Panel A) and automatic quantification of the tenting volume (Panel B). Figure 7. Three-dimensional colour flow data set showing the origin of mitral regurgitation jet. Multiple slicing of the proximal part of the jet (dotted lines) allows the identification of the smallest vena contracta area planimetry. Two different cases, with different orifice shapes and sizes, are illustrated. (A) and (B). 3DE (particularly 3D TEE) is pivotal to assess MV prosthesis normal function (Figure 9) and to evaluate for potential complications: endocarditis, thrombosis, dehiscence, paravalvular leaks, etc. (Figure 10 and 11). Localisation, size, and mobility of the prosthetic masses are essential information in evaluating the risk of embolization and the proper management strategy. 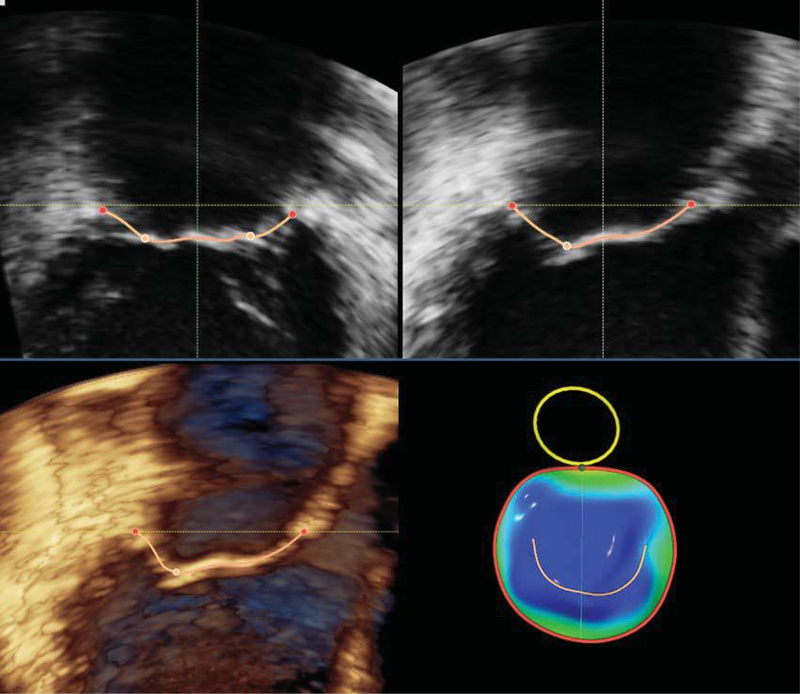 Prosthetic dehiscence or paravalvular leaks are accu-rately assessed using 3D colour Doppler imaging and 360° rotation around the prosthetic ring, providing critical information for management decision. Congenital abnormalities of the MV include both stenotic and regurgitant lesions (Figure 12) and the advantages of the 3DE in defining the anatomy of defects and quantifying their haemodynamic implications are similar as described before. The wide range of options to post-process the 3D dataset (cropping, rotation etc. ), the multiple displaying modalities (vo-lume rendering, tomographic multi-slices), as well as the unique perception of depth offered by 3DE are pivotal in the process of understanding the complexity of congenital abnormalities46,47. A recent study addres-sing the prevalence of MV cleft in a population with significant MR, using 3DE, has shown a 3.3% of isola-ted MV cleft in this population48, a considerably higher percentage compared with previous results based on 2DE (0.07% for isolated posterior mitral leaflet cleft and unknown for isolated anterior mitral left cleft), these results being representative for the increased accuracy of 3DE compared to 2DE in evaluating complex MV diseases49. Figure 8. Anterior mitral leaflet perforation (arrow) complicating native aortic valve endocarditis. Transthoracic three-dimensional volume rendering (Panel A) and intra-operative (Panel B) views. Figure 9. Three-dimensional transesophageal volume rendering of a me-chanical prosthesis visualised from the surgical view for morphological and functional characterization. For the past decade, several percutaneous transca-theter procedures addressing MV pathologies have emerged as alternatives to traditional surgical therapy in high-risk patients. Newer interventional therapies for MV disease – as edge-to-edge repair, annuloplasty, chordal implantation or transcatheter mitral valve re-placement (TMVR) – rely on real-time visualization of the MV in the beating heart using echocardiographic guidance as the leaflet are not visible at fluoroscopy and MV diseases are often associated to limited de-generative calcification50. Delivery catheters, devices, and target structures can be visualized in one single view using 3D TEE, optimizing the transseptal punctu-re, the steering of the catheters towards the MV and proper positioning of the device in relation to MV ana-tomy51. TEE visualization of the MV during interventi-ons can guide the prosthesis to reach its final position, assess the success of repair, and allow quantification of the residual regurgitation. Intraprocedural guidance of MV repair with Mitra-Clip system is primarily based on 2DE and 3DE, with limited utility of fluoroscopy52. 3DE TEE plays a leading role in all the procedural steps for MitraClip implanta-tion: transseptal puncture, device positioning, proper leaflet grasping and post-deployment evaluation of the results (residual MV orifice area and MR reduction, difficult to assess given the double – or even triple – MV orifice and the subsequent multiple regurgitation jets) and possible complications (iatrogenic interatrial defect)53. Artificial chordal implantation is another option for patients with degenerative MV disease and TEE 3DE plays a major role in patient selection, identifying the site of implantation (site of prolapse), the number of chords needed, as well as the appropriate chordal length. During the procedure, TEE is useful in checking the LV site of puncture, excluding subvalvular appa-ratus entrapment by the delivery catheters, ensuring adequate grasping of the desired scallop(s) and adap-tation of neochordae length according to the real-time evaluation of the MR severity36. With regard to TMVR, 3D TEE is of major impor-tance for pre-procedural anatomical assessment of the MA and to identify the landmarks used for val-ve deployment (trigons, aorto-mitral continuity etc. ), for characterization of the landing zone – essential in selecting the most appropriate device based on their specific characteristics –, for intraprocedural guidance, confirmation of proper device position, MV prosthesis functional assessment and procedure-related compli-cations3,51,54. For valve-in-valve TMVR, 3D TEE has an additional role in assessing the presence of inter-de-vice regurgitation (between the transcatheter device and surgical bioprosthesis), with guidance for further balloon post-dilatation in case that multiple jets are evident around the circumference of the newly implanted valve53. MV paravalvular leak is associated with increased morbidity and reoperation has increased mortality risk, making transcatheter closure a good option in patients with significant regurgitant volume or hae-molysis (Figure 13)55. 3D TEE is the preferred imaging modality for pre-procedural evaluation of the orifice shape and size (planimetric area), for peri-procedural guidance – including the use for additional devices –, post-procedural evaluation of the results and follow-up56. Newly developed technologies that synchronize multimodality imaging – fusion imaging – may incre-ase diagnostic accuracy and procedural precision in transcatheter MV repair and replacement5. Of parti-cular importance is echocardiographic and fluorosco-pic imaging fusion (i.e. EchoNavigator system, Philips Healthcare), which facilitates procedural guiding in MV repair by providing depth perception and demon-strating the relationship between devices and surro-unding structures – 2DE and 3DE images superimpo-sed on fluoroscopic projection – as well as visualizing the regurgitant jet on the fluoroscopic silhouette and allowing the selection of the ideal device position57,58. Moreover, fusion imaging has the potential to enhance the safety of the procedures and to reduce the fluoroscopy and procedure times52. Figure 10. Mitral prosthesis masses. Three-dimensional volume transesophageal volume rendering from the surgical (panelA) and ventricular (Panels B and C) views of a mitral bioprosthesis with signs of degeneration (calcifications, green arrows) and a thrombotic mass (red arrow, between 7 and 10 o’clock). Figure 11. Mitral periprosthetic regurgitation. Three-dimensional transesophageal volume rendering (Panel A) and colour flow acquisition (Panel B) show-ing anterolateral periprosthetic regurgitation (between 10-12 o’clock). Multi-slice display to allow planimetric quantitation of the regurgitant orifi ce (Panel C). Figure 12. Congenital mitral valve diseases. 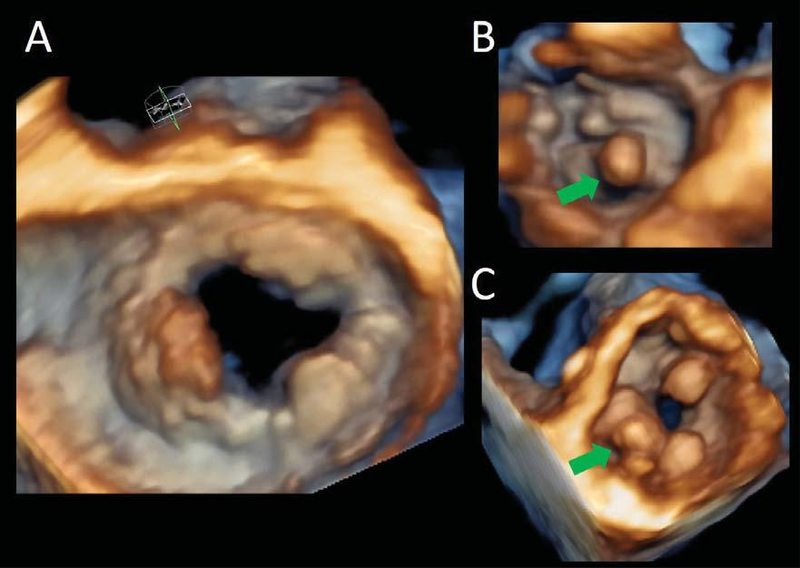 Two-dimensional short axis view (Panel A) and three-dimensional transthoracic volume rendering of an ante-rior mitral leaflet cleft from the ventricular perspective (Panel B) in a patient with an incomplete atrio-ventricular canal. Surgical view of the mitral valve showing posterior mitral leaflet cleft, between P2 and P3 scallops (Panel C). 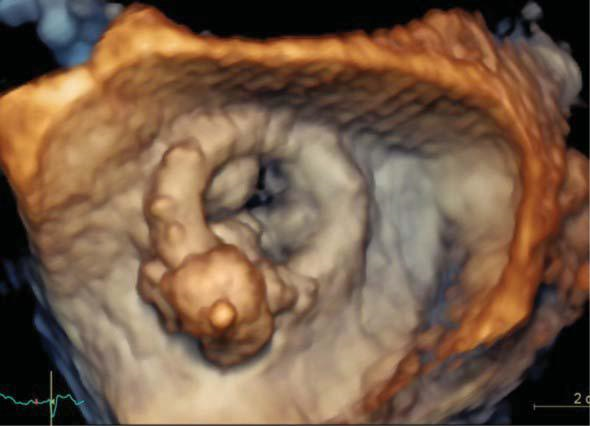 Three-dimensional transthoracic volume rendering from the ventricular side showing a double orifice mitral valve – yellow arrows – (Panel D). Transthoracic three-dimensional volume rendering from the ventricular view (Panel E) allowing an accurate identification of the anatomy and localisation of the accessory tissue (red arrow). Two-dimensional transversal cut plane obtained from a transthoracic three-dimensional data set using an intermediary plane between the levels of the aortic valve and the mitral valve to visualise accessory mitral valve tissue (Panel F). Figure 13. Transesophageal three-dimensional surgical view of the mitral biological prosthesis after perivalvular leak closure showing the final (pos-terolateral) position of the plug. Traditionally, 3DE was subject to artefacts related to inaccurate gain settings, the inability of the patient to hold respiration and the presence of arrhythmias. Moreover, high-quality transthoracic 3D data sets are greatly dependent on a good acoustic window and the experience of the echocardiographer. 3D TEE images are easier to obtain, real-time acquisitions being often suffi cient for an accurate diagnosis due to the redu-ced 3D volume acquisition and high spatial resolution. However, the new 3D technology allowing single-beat acquisitions at high frame-rate has overcome most of the previous limitations, and the automated software packages for MV geometry assessment requiring only minimal manual intervention have made 3DE easier to learn and more reproducible. Another limitation of 3DE is the lack of tissue cha-racterization. Since the different colors of the images are coding the depth of the structure from the trans-ducer and not the tissue characteristics, differentia-ting intracardiac masses (calcifications, tumor versus thrombus or endocarditis versus thrombus) is chal-lenging by 3DE only. Moreover, due to the lower spa-tial resolution, small structures (such as vegetations) appear larger in 3DE than in 2DE images, a limitation that can be overcome by displaying 3D datasets as lon-gitudinal or transversal 2D slices. The advent of 3DE has changed completely the way the MV is evaluated by echocardiography and ope-ned a new era in the transcatheter treatment of MV diseases. Application of 3DE in the evaluation of MV contributes with essential anatomical and functional information, independently of the clinical indication, and should be the technique of choice whenever a complex MV lesion is suspected. The systematic trai-ning in 3DE acquisition and interpretation appears to be pivotal in the near future for physicians dealing with patients with MV diseases. Financial support: Dr. Andrada C. Guta has received a research grant from the Romanian Society of Cardiology in 2018. 1. Muraru D, Cattarina M, Boccalini F, Dal Lin C, Peluso D, Zoppellaro G, et al. Mitral valve anatomy and function: new insights from three-dimensional echocardiography. J Cardiovasc Med (Hagerstown). 2013;14(2):91-9. 2. Corrigan FE, 3rd, Maini A, Reginauld S, Lerakis S. Contemporary evaluation of mitral regurgitation – 3D echocardiography, cardiac magnetic resonance, and procedural planning. Expert Rev Cardio-vasc Ther. 2017;15(9):715-25. 3. Natarajan N, Patel P, Bartel T, Kapadia S, Navia J, Stewart W, et al. Peri-procedural imaging for transcatheter mitral valve replacement. Cardiovasc Diagn Ther. 2016;6(2):144-59. 4. Badano LP, Boccalini F, Muraru D, Bianco LD, Peluso D, Bellu R, et al. Current clinical applications of transthoracic three-dimensional echocardiography. J Cardiovasc Ultrasound. 2012;20(1):1-22. 5. Lange A, Palka P, Burstow DJ, Godman MJ. Three-dimensional echo-cardiography: historical development and current applications. J Am Soc Echocardiogr. 2001;14(5):403-12. 6. Lang RM, Badano LP, Tsang W, Adams DH, Agricola E, Buck T, et al. EAE/ASE recommendations for image acquisition and display using three-dimensional echocardiography. Eur Heart J Cardiovasc Imag-ing. 2012;13(1):1-46. 7. Solis J, Sitges M, Levine RA, Hung J. Three-dimensional echocardiog-raphy. New possibilities in mitral valve assessment. Rev Esp Cardiol. 2009;62(2):188-98. 8. Dal-Bianco JP, Beaudoin J, Handschumacher MD, Levine RA. Basic mechanisms of mitral regurgitation. Can J Cardiol. 2014;30(9):971-81. 9. McCarthy KP, Ring L, Rana BS. Anatomy of the mitral valve: under-standing the mitral valve complex in mitral regurgitation. Eur J Echo-cardiogr. 2010;11(10):i3-9. 10. Garbi M, Monaghan MJ. Quantitative mitral valve anatomy and pa-thology. Echo Res Pract. 2015;2(3):R63-72. 11. Mihaila S, Muraru D, Piasentini E, Miglioranza MH, Peluso D, Cuc-chini U, et al. Quantitative analysis of mitral annular geometry and function in healthy volunteers using transthoracic three-dimensional echocardiography. J Am Soc Echocardiogr. 2014;27(8):846-57. 12. Mihaila S, Muraru D, Casablana S, Peluso D, Cucchini U, Del Bianco L, et al. Three-dimensional changes in mitral valve annulus in organic and functional mitral regurgitation: insights for mitral valve repair. European Heart Journal. 2013;34(supplement 1):P4751. 13. Aruta P MD, Guta AC, Mihaila S, Ruozi N, Palermo C, Elnagar B, Ili-ceto S, Badano LP. Comparison of mitral annulus geometry between patients with ischemic and non-ischemic functional mitral regurgita-tion. Implications for transcatheter mitral valve implantation. Car-diovascular Ultrasound. 2018 (in press). 14. Chew PG, Bounford K, Plein S, Schlosshan D, Greenwood JP. Multi-modality imaging for the quantitative assessment of mitral regurgita-tion. Quant Imaging Med Surg. 2018;8(3):342-59. 15. Choi J, Heo R, Hong GR, Chang HJ, Sung JM, Shin SH, et al. Differen-tial effect of 3-dimensional color Doppler echocardiography for the quantification of mitral regurgitation according to the severity and characteristics. Circ Cardiovasc Imaging. 2014;7(3):535-44. 16. Altiok E, Hamada S, van Hall S, Hanenberg M, Dohmen G, Almalla M, et al. Comparison of direct planimetry of mitral valve regurgita-tion orifice area by three-dimensional transesophageal echocardiog-raphy to effective regurgitant orifice area obtained by proximal flow convergence method and vena contracta area determined by color Doppler echocardiography. Am J Cardiol. 2011;107(3):452-8. 17. Abudiab MM, Chao CJ, Liu S, Naqvi TZ. Quantitation of valve regur-gitation severity by three-dimensional vena contracta area is supe-rior to flow convergence method of quantitation on transesophageal echocardiography. Echocardiography. 2017;34(7):992-1001. 18. Matsumura Y, Saracino G, Sugioka K, Tran H, Greenberg NL, Wada N, et al. Determination of regurgitant orifice area with the use of a new three-dimensional flow convergence geometric assumption in functional mitral regurgitation. J Am Soc Echocardiogr. 2008; 21(11): 1251-6. 19. Chandra A SI, Sugeng L, Weinert L, Settlemier SH, Mor-Avi V, Lang RM. A three-dimensional insight into the complexity of fl ow conver-gence in mitral regurgitation: adjunctive benefi t of anatomic regurgi-tant orifice area. Am J Physiol Heart Circ Physiol. 2011;301:H1015-H24. 20. Chandra S, Salgo IS, Sugeng L, Weinert L, Settlemier SH, Mor-Avi V, et al. A three-dimensional insight into the complexity of flow con-vergence in mitral regurgitation: adjunctive benefit of anatomic re-gurgitant orifice area. Am J Physiol Heart Circ Physiol. 2011; 301(3): H1015-24. 21. Skaug TR, Hergum T, Amundsen BH, Skjaerpe T, Torp H, Haugen BO. Quantification of mitral regurgitation using high pulse repetition frequency three-dimensional color Doppler. J Am Soc Echocardiogr. 2010;23(1):1-8. 22. Song JM, Kim MJ, Kim YJ, Kang SH, Kim JJ, Kang DH, et al. Three-di-mensional characteristics of functional mitral regurgitation in patients with severe left ventricular dysfunction: a real-time three-dimension-al colour Doppler echocardiography study. Heart. 2008;94(5):590-6. 23. Zoghbi WA, Adams D, Bonow RO, Enriquez-Sarano M, Foster E, Grayburn PA, et al. Recommendations for Noninvasive Evaluation of Native Valvular Regurgitation: A Report from the American Soci-ety of Echocardiography Developed in Collaboration with the Soci-ety for Cardiovascular Magnetic Resonance. J Am Soc Echocardiogr. 2017;30(4):303-71. 24. Lang RM, Badano LP, Mor-Avi V, Afilalo J, Armstrong A, Ernande L, et al. Recommendations for cardiac chamber quantification by echocardiography in adults: an update from the American Society of Echocardiography and the European Association of Cardiovascular Imaging. Eur Heart J Cardiovasc Imaging. 2015;16(3):233-70. 25. Badano LP, Miglioranza MH, Mihaila S, Peluso D, Xhaxho J, Marra MP, et al. Left Atrial Volumes and Function by Three-Dimensional Echocardiography: Reference Values, Accuracy, Reproducibility, and Comparison With Two-Dimensional Echocardiographic Measure-ments. Circ Cardiovasc Imaging. 2016;9(7). 26. Muraru D, Badano LP, Peluso D, Dal Bianco L, Casablanca S, Koca-bay G, et al. Comprehensive analysis of left ventricular geometry and function by three-dimensional echocardiography in healthy adults. J Am Soc Echocardiogr. 2013;26(6):618-28. 27. Muraru D, Badano LP. Quantitative analysis of the left ventricle by echocardiography in daily practice: as simple as possible, but not sim-pler. J Am Soc Echocardiogr. 2014;27(10):1025-8. 28. Yingchoncharoen T, Negishi T, Stanton T, Marwick TH. Incremental value of three-dimensional echocardiography in the evaluation of left ventricular size in mitral regurgitation: a follow-up study after mitral valve surgery. J Am Soc Echocardiogr. 2014;27(6):608-15. 29. Ring L, Abu-Omar Y, Kaye N, Rana BS, Watson W, Dutka DP, et al. Left Atrial Function Is Associated with Earlier Need for Cardiac Sur-gery in Moderate to Severe Mitral Regurgitation: Usefulness in Tar-geting for Early Surgery. J Am Soc Echocardiogr. 2018;31(9):983-91. 30. Min SY, Song JM, Kim YJ, Park HK, Seo MO, Lee MS, et al. Discrep-ancy between mitral valve areas measured by two-dimensional pla-nimetry and three-dimensional transoesophageal echocardiography in patients with mitral stenosis. Heart. 2013;99(4):253-8. 31. Schlosshan D, Aggarwal G, Mathur G, Allan R, Cranney G. Real-time 3D transesophageal echocardiography for the evaluation of rheu-matic mitral stenosis. JACC Cardiovasc Imaging. 2011;4(6):580-8. 32. Zamorano J, Cordeiro P, Sugeng L, Perez de Isla L, Weinert L, Ma-caya C, et al. Real-time three-dimensional echocardiography for rheumatic mitral valve stenosis evaluation: an accurate and novel ap-proach. J Am Coll Cardiol. 2004;43(11):2091-6. 33. Anwar AM, Attia WM, Nosir YF, Soliman OI, Mosad MA, Othman M, et al. Validation of a new score for the assessment of mitral ste-nosis using real-time three-dimensional echocardiography. J Am Soc Echocardiogr. 2010;23(1):13-22. 34. Wilkins GT, Weyman AE, Abascal VM, Block PC, Palacios IF. Per-cutaneous balloon dilatation of the mitral valve: an analysis of echo-cardiographic variables related to outcome and the mechanism of dilatation. Br Heart J. 1988;60(4):299-308. 35. Zamorano J, Perez de Isla L, Sugeng L, Cordeiro P, Rodrigo JL, Al-meria C, et al. Non-invasive assessment of mitral valve area dur-ing percutaneous balloon mitral valvuloplasty: role of real-time 3D echocardiography. Eur Heart J. 2004;25(23):2086-91. 36. Wunderlich NC, Beigel R, Ho SY, Nietlispach F, Cheng R, Agricola E, et al. Imaging for Mitral Interventions: Methods and Efficacy. JACC Cardiovasc Imaging. 2018;11(6):872-901. 37. Darsee JR, Mikolich JR, Nicoloff NB, Lesser LE. Prevalence of mi-tral valve prolapse in presumably healthy young men. Circulation. 1979;59(4):619-22. 38. Procacci PM, Savran SV, Schreiter SL, Bryson AL. Prevalence of clinical mitral-valve prolapse in 1169 young women. N Engl J Med. 1976;294(20):1086-8. 39. Levine RA, Handschumacher MD, Sanfilippo AJ, Hagege AA, Har-rigan P, Marshall JE, et al. Three-dimensional echocardiographic re-construction of the mitral valve, with implications for the diagnosis of mitral valve prolapse. Circulation. 1989;80(3):589-98. 40. Tamborini G, Muratori M, Maltagliati A, Galli CA, Naliato M, Zano-bini M, et al. Pre-operative transthoracic real-time three-dimensional echocardiography in patients undergoing mitral valve repair: accura-cy in cases with simple vs. complex prolapse lesions. Eur J Echocar-diogr. 2010;11(9):778-85. 41. Pepi M, Tamborini G, Maltagliati A, Galli CA, Sisillo E, Salvi L, et al. Head-to-head comparison of two- and three-dimensional transtho-racic and transesophageal echocardiography in the localization of mi-tral valve prolapse. J Am Coll Cardiol. 2006;48(12):2524-30. 42. Tsang W, Lang RM. Three-dimensional echocardiography is essential for intraoperative assessment of mitral regurgitation. Circulation. 2013;128(6):643-52; discussion 52. 43. Pardi MM, Pomerantzeff PMA, Sampaio RO, Abduch MC, Brandao CMA, Mathias W, Jr., et al. Relation of mitral valve morphology to surgical repair results in patients with mitral valve prolapse: A three-dimensional transesophageal echocardiography study. Echocardiog-raphy. 2018. 44. Lang RM, Tsang W, Weinert L, Mor-Avi V, Chandra S. Valvular heart disease. The value of 3-dimensional echocardiography. J Am Coll Cardiol. 2011;58(19):1933-44. 45. Ring L, Dutka DP, Wells FC, Fynn SP, Shapiro LM, Rana BS. Mecha-nisms of atrial mitral regurgitation: insights using 3D transoesopha-geal echo. Eur Heart J Cardiovasc Imaging. 2014;15(5):500-8. 46. Ermacora D, Muraru D, Cecchetto A, Cucchini U, Badano LP. Trans-thoracic three-dimensional echocardiography visualization of func-tional anatomy of double-orifice mitral valve. Eur Heart J Cardiovasc Imaging. 2015;16(8):862. 47. Di Salvo G, Miller O, Babu Narayan S, Li W, Budts W, Valsangiaco-mo Buechel ER, et al. Imaging the adult with congenital heart disease: a multimodality imaging approach-position paper from the EACVI. Eur Heart J Cardiovasc Imaging. 2018. 48. Narang A, Addetia K, Weinert L, Yamat M, Shah AP, Blair JE, et al. Diagnosis of Isolated Cleft Mitral Valve Using Three-Dimensional Echocardiography. J Am Soc Echocardiogr. 2018. 49. Wyss CA, Enseleit F, van der Loo B, Grunenfelder J, Oechslin EN, Jenni R. Isolated cleft in the posterior mitral valve leaflet: a congenital form of mitral regurgitation. Clin Cardiol. 2009;32(10):553-60. 50. Taramasso M, Feldman T, Maisano F. Transcatheter mitral valve re-pair: review of the clinical evidence. EuroIntervention. 2018;14(AB): AB91-AB100. 51. Sugimoto T, Dulgheru R, Marchetta S, Ilardi F, Contu L, Go YY, et al. What Does 3D Echocardiography Add to 2D Echocardiography in the Assessment of Mitral Regurgitation? Curr Cardiol Rep. 2017; 19(10):90. 52. Wunderlich NC, Siegel RJ. Peri-interventional echo assessment for the MitraClip procedure. Eur Heart J Cardiovasc Imaging. 2013; 14(10):935-49. 53. Khalique OK, Hahn RT. Role of Echocardiography in Transcathe-ter Valvular Heart Disease Interventions. Curr Cardiol Rep. 2017; 19(12):128. 54. Blanke P, Naoum C, Webb J, Dvir D, Hahn RT, Grayburn P, et al. Multimodality Imaging in the Context of Transcatheter Mitral Valve Replacement: Establishing Consensus Among Modalities and Disci-plines. JACC Cardiovasc Imaging. 2015;8(10):1191-208. 55. Rihal CS, Sorajja P, Booker JD, Hagler DJ, Cabalka AK. Principles of percutaneous paravalvular leak closure. JACC Cardiovasc Interv. 2012;5(2):121-30. 56. Bouchard MA, Cote-Laroche C, Beaudoin J. Multi-Modality Imaging in the Evaluation and Treatment of Mitral Regurgitation. Curr Treat Options Cardiovasc Med. 2017;19(12):91. 57. Faletra FF, Berrebi A, Pedrazzini G, Leo LA, Paiocchi VL, Cautilli G, et al. 3D transesophageal echocardiography: A new imaging tool for assessment of mitral regurgitation and for guiding percutaneous edge-to-edge mitral valve repair. Prog Cardiovasc Dis. 2017; 60(3): 305-21. 58. Faletra FF, Pozzoli A, Agricola E, Guidotti A, Biasco L, Leo LA, et al. Echocardiographic-fl uoroscopic fusion imaging for transcatheter mitral valve repair guidance. Eur Heart J Cardiovasc Imaging. 2018; 19(7):715-26.